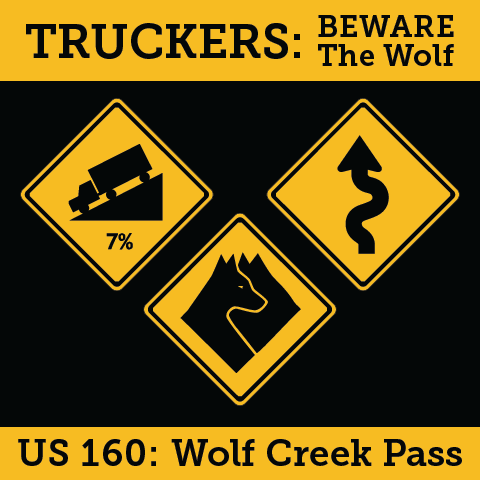 From 2011 to 2015, 49 semi-truck drivers have crashed on the west side of Wolf Creek Pass (aka, US Highway 160). In that time frame, two truck drivers have been killed in crashes on the Pass. 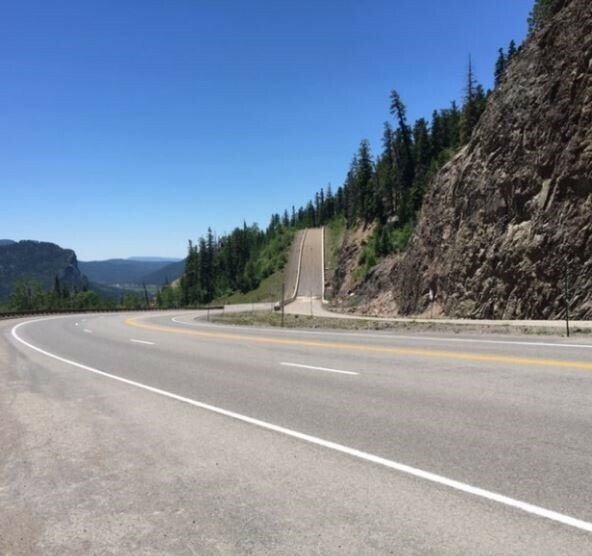 Most crashes on the Pass occur at the switchback curve near the Wolf Creek scenic outlook area. DOWNLOAD OUR US 160 FLIER. Check brakes before descending the Pass. Maintain a low speed in low gear, and use flashers to warn other vehicles of your speed. Do not "ride" the truck's brakes; this will cause overheating and possible loss of the brake system. You might consider Jake Brakes (or compression brakes) a useful braking mechanism to help control the speed of a heavy truck. However, the best practice is to remain in low gears to avoid overheating. Keep brakes cool by pulling into brake stations, or onto the shoulder of the road, if you can locate a safe spot. Maneuver the trucks into the far right lane before approaching upgrade ramps. As the truck approaches the runaway ramp, steer straight and try to keep the wheels aligned. Ramps are narrow; attempt to stay in the center of the ramp to avoid any risk of rolling over. Once the truck is stopped, call 911 to report the incident, even if there are not injures. There is NO fee, penalty, or fine for using runaway truck ramps. The only costs associated would be any law enforcement fines associated with a possible citation (for faulty equipment or driving negligence), as well as any billing from the towing company for their services of recovering the vehicle. 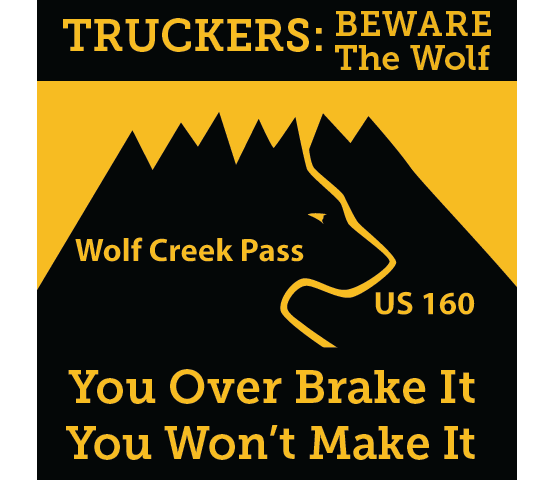 With stretches as wide as four lanes, US 160/Wolf Creek Pass can deceive drivers into thinking there is ample room to navigate it. Adding high speeds to this miscalculation creates dangerous conditions—particularly for commercial vehicle drivers. Take the time to familiarize yourself with this mountain pass. Westbound commercial vehicle drivers must maintain a speed of no faster than 25 mph downhill from the summit. Understand the steepness of the Pass. The west side of the Pass is at a 7 percent downhill grade. The Pass features a dangerous hairpin curve six-and-a-half miles from the summit. Know how far you'll travel. 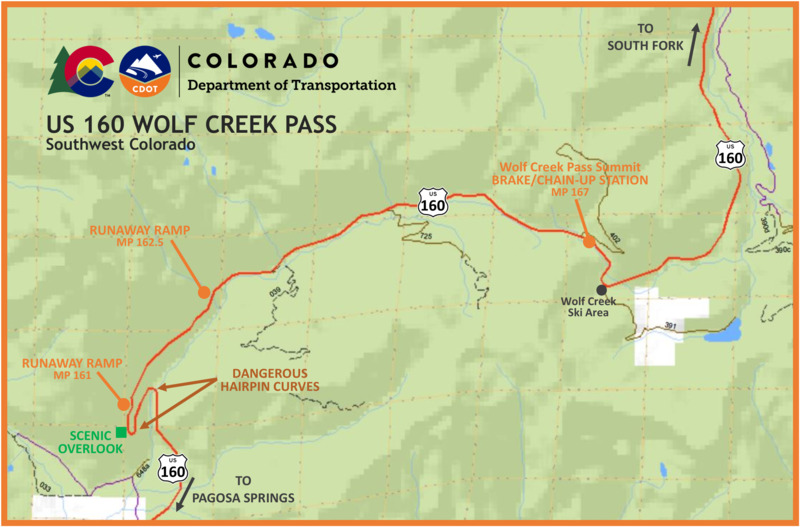 Drivers will travel more than eight miles from the summit (near the Wolf Creek Ski Area) to the west base of the Pass (near Treasure Falls). Points of access along the Pass include a ski area, forest roads and a public scenic lookout. Know where to find brake and chain-up stations. Inspect your brakes at the summit before descending the eight-mile trip. A wide shoulder area is available to eastbound and westbound motorists. This area can also be used as chain-up station. 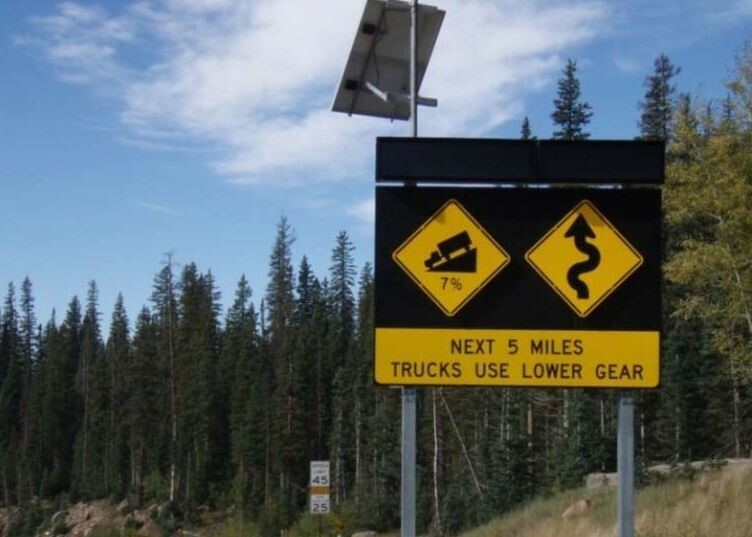 Know where to find the runaway truck ramps. At mile point (MP) 162.5, about 4.5 miles from the summit. MP 161, about six miles from the summit. Note: This is your last chance to use a runaway ramp.